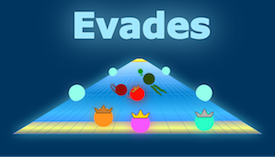 Evades.io | Play Evades.io free on iogames.space! Head right. Use arrow keys or WASD to move. Press Z and X to activate abilities 1 and 2. Or you can use J and K.
Use 1, 2, 3, 4, 5 to upgrade your speed, energy, regeneration, ability 1, ability 2. This world has 40 areas. Reach the end and unlock new heroes. You must make an account to unlock heroes. Blue bar over your head is your energy. Pick Up Pellets to Gain Experience! If you collect enough pellets, you level up and get a point! Spend your points on upgrades (1, 2, 3, 4, 5). Hover your cursor over the icons to see what abilities you can unlock! Touch dead players to rescue them! Press H to hide the hero info card. Press V to hide the chat. Press M to hide the map. Press G to change the map view. Hold shift to slow down. You have one life. If an enemy touches you, you will go down. Someone can save you if they touch you before the timer runs out. There are many different worlds to explore. Just use the light blue areas in area 1 to travel to them. Stellar Square is just for fun. It's like a small arena where you can throw snowballs at your friends to freeze them. Use shift to control your speed. Very useful when it gets crowded with enemies! Press enter to start typing into the chat and press enter again to send your message. Make friends with your teammates! They are your most indispensable resource since they can save you. Be careful of wall enemies. They prevent you from hugging the wall. Defeating a new region will unlock a new hero! Hide the hero card to increase visibility of enemies at the bottom of the screen. Play Central Core and Monumental Migration first. These are the easiest regions to beat. They will get you on the hall of fame. To win a bronze crown, you have to be in the top 25. Silver crown is top 10. Gold crown is top 3. Hall of fame resets and crowns are awarded every Sunday at 4pm EST. The World of Evades changes every week! We have a Discord! Click the discord icon on the homepage to join our friendly community and get updates quickly! The two main developers (Micreox and Stovoy) stream regularly. Tune in on their Twitch! Getting lag or sudden frame drops? Connect your ethernet to fix any frame drops! A stable internet connection will go a long way. This is a real-time multiplayer game running at 30 fps. A reliable connection is necessary for a smooth experience. Still getting lag? Go to our discord (click on the discord icon on the homepage) and report it in the bug-reports channel. Thanks in advance. We will fix it as quickly as possible! Getting a black screen or it's just not loading? Try Chrome or Safari. It will definitely work on those browsers. By far the best io game! Absolutely love this game, you should definitely check it out! Evades is a simple looking yet fantastic game. When I first played it I thought it looked dumb, but I was wrong, this game is so fun and addictive and by far the best .io game I have ever played! Хорошая работа, разработчики. Благодарю за феноменальную игру, которая стала частью моей жизни уже на протяжении двух лет. Good work, developers. Thank you for the phenomenal game that has become part of my life for the past two years.